This 3-piece set includes the 4-Fold Kapok-Mattress, a matching bolster and Neck-cushion. These comfortable cushions turn any space into a beautiful and relaxing sanctuary. And the mattress can be folded up and stored away easily. To ensure superior quality, all our products have double stitched seams and 100% Kapok filling. Kapok filled cushions and mattresses are rather firm and therefore have their very own comfort. Kapok is light, hygienic, hypoallergenic, and environmentally friendly. Thus Kapok is easily superior to many other filling materials concerning comfort and longevity. 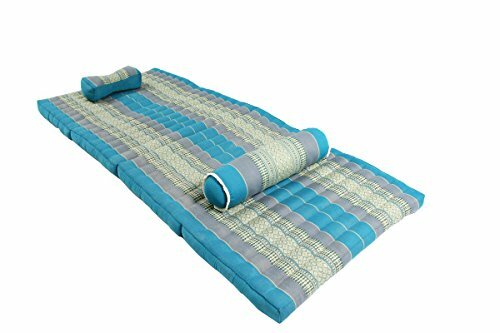 Thai Massage Set includes: 1 4-Fold Mattress (79x32) inches. 1 Yoga&Neck Bolster: 20x6 inches. 1 Massage Cushion 12x6 inches. If you have any questions about this product by Handelsturm, contact us by completing and submitting the form below. If you are looking for a specif part number, please include it with your message.